Patrolman George Dapping was shot and killed as he and another Patrolman attempted to stop a group of individuals that were causing a disturbance at a picnic. Local politicians were holding an annual picnic and ball at the Manhattan Casino on 155th Street. Shortly after midnight a fight broke out when members of a rival political group arrived at the location. Several gunshots were fired. Patrolman Dapping and another Patrolmen, who were off-duty, ran into the crowd in an attempt to apprehended the gunman. Patrolman Dapping was shot and killed, and the other Patrolman was wounded. The subject that killed Patrolman Dapping was apprehended. He was convicted of murder, and executed on October 7, 1916. 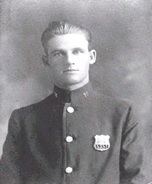 Patrolman Dapping served with the New York City Police Department for two years. I am proud to have a great uncle as george dapping.